All primary school children who are eligible to receive free school meals are also entitled to free school milk. 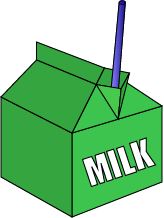 Milk is available to all other primary school children for £27.30 per year. This is payable at the start of the school year. The amount of milk provided is one-third of a pint per day during term time. The charge for milk is subsidised by the European Community and the Welfare Food Reimbursement Unit. Children that have milk at school will normally have it just after morning play time. Reception children are free to have their milk when they want it during the day. All children at Lord Blyton will receive a free piece of fruit or vegetable every school day. This provides them with one of their 5 a day fruit and vegetable portions. There is a different piece of fruit or vegetable every day. We get various fruits and vegetables delivered with this scheme, usually there are bananas, apples, pears, carrots, tomatoes, and easy-peel citrus fruits such as satsumas. Sometimes we get raisins and have been known to get small cucumbers, so the children get to try a wide variety of fruit and vegetables. You can find out more about this scheme on the NHS Choices Website.